The Illinois Railway Museum (IRM) moved to its present home at Union in 1964. Track was relaid on the former right-of-way of the Elgin & Belvidere interurban to become the main line “demonstration railroad” for steam, diesel, and interurban trains. A mile-long electric loop track was constructed around the main grounds to circulate museum visitors via electric streetcars. The 1851 Marengo passenger depot, the 1890 interlocking Tower from Spaulding, and the 1910 50th Avenue “L” Station, from Cicero are among the significant Illinois structures moved to the property, and the grounds are filled with railroad signs, signals, and small structures saved from transit systems and mainline railroads. Large multiple-track barns are used for storage, display, and restoration of equipment. Footage for our program captured a variety of operating equipment over a four-year period at the museum during regular and special operating days. Included is a significant number of IRM’s electric collection of all types, diesel powered trains, and Frisco steam locomotive 1630. Additionally, two outreach trips when IRM equipment traveled to Rock Island, Illinois for the 2011Train Festival and the 2014 Streamliners at Spencer event in North Carolina demonstrate what this fine museum and its volunteers are capable of. 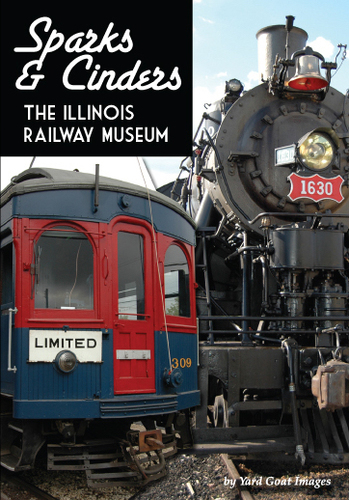 The DVD is an introduction to the IRM, now the largest railroad museum in the United States. Approximately 87 minutes. Footage captured with multiple tripod-mounted HD cameras. DVD conveniently organized by chapters. Minimal narration.